The forecast calls for winds and seas to increase on Easter Sunday. 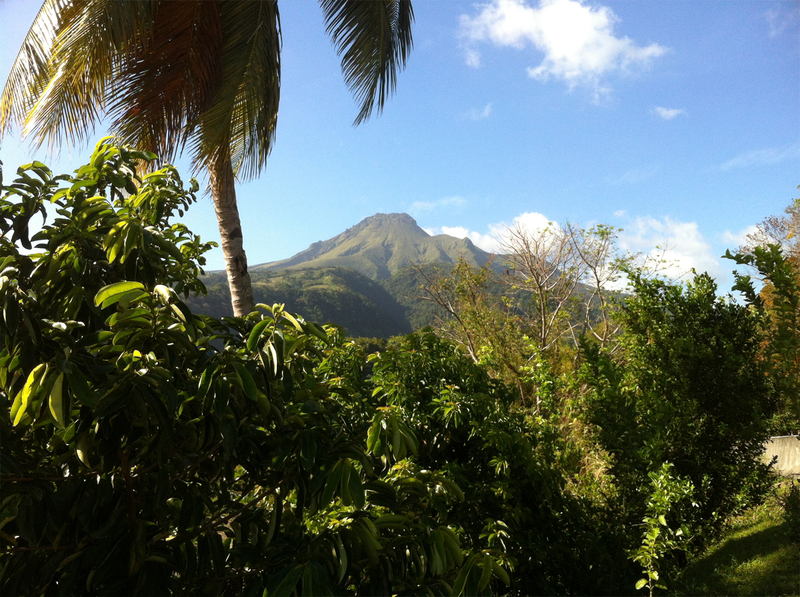 It would be fun to remain in Dominica for a few more days of hiking. However, everything on the island will be closed until Tuesday. 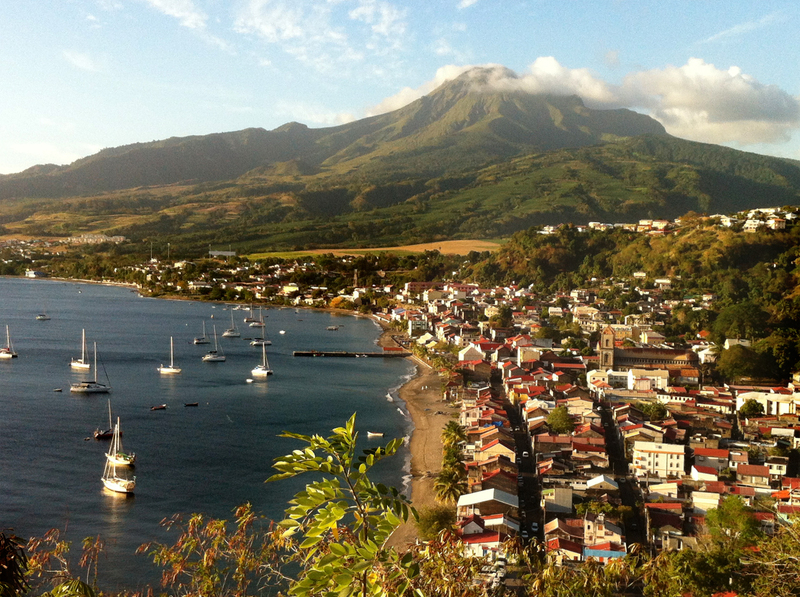 In light of the weather, the decision is reached to leave Roseau and move on to Martinique in the Windward Islands. 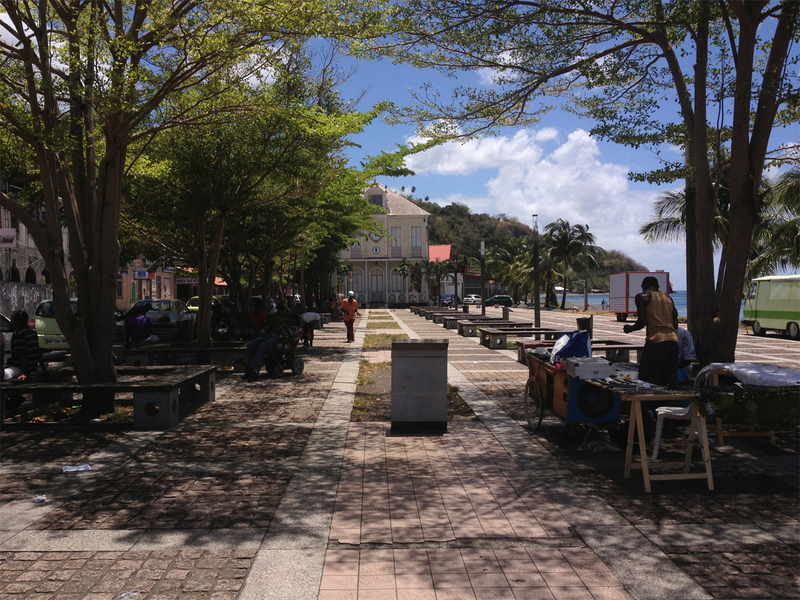 The Customs office is located at the ferry dock on Roseau’s waterfront. There is a question as to whether the office will be open on a holiday weekend. The good news is that Customs officials are working on Saturday morning due to ferry arrivals and departures. The bad news is that we are not permitted to enter the office until hundreds of ferry passengers have disembarked and cleared Customs. The ferry is filled to capacity with inbound passengers that are visiting with family and friends over the long Easter weekend. The streets near the terminal are packed with taxis and private vehicles awaiting their passengers. There is a slow trickle of inbound passengers through the exit turnstyle, emerging one at a time from Customs, laden with suitcases, packaged gifts and household items. Taxi drivers are busy hustling the crowd, looking for work. Family members embrace as they are reunited, then scurry off to waiting vehicles. After watching this scene unfold for nearly two hours, we are finally given permission to enter the office. Customs officials are jovial, knowing that soon they will be able to kick back and enjoy the holiday weekend. Within ten minutes, our clearance papers are stamped. We are free to depart. Cutter Loose is underway from Roseau at 1 PM. 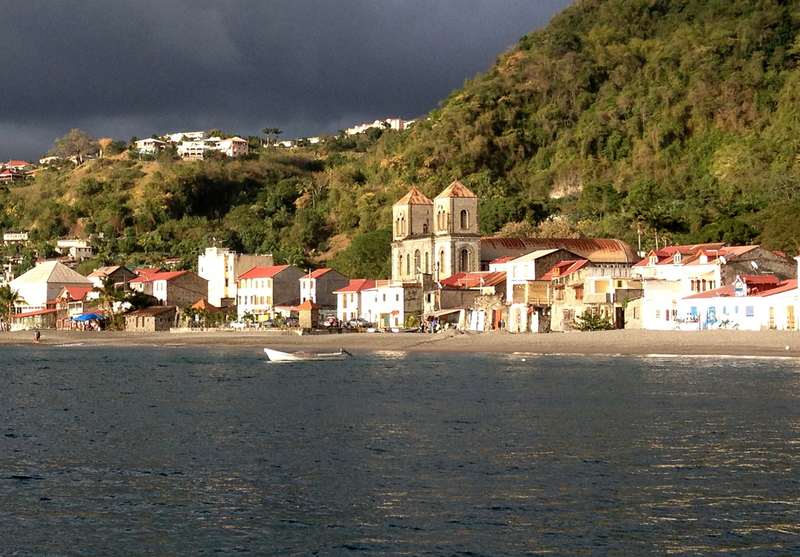 Our destination is the small town of St. Pierre on the northwest coast of Martinique, a journey of 40 miles. We must make rapid progress to St. Pierre in order to arrive before dark. The wind does everything in its power to oblige. Under a reefed mainsail, we are treated to yet another rollicking beam reach in 20+ knots of wind. Cutter Loose is in her element. She responds with boat speeds in the 7 to 8 knot range. From a pure sailing standpoint, it doesn’t get much better than the Eastern Caribbean. 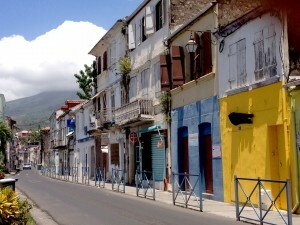 Martinique is another volcanic island. Mt. Pelée on the northern coast is clearly visible from a distance of 25 miles. Once inside the lee of Pelée, the wind becomes fluky. Now motor sailing, St. Pierre is visible in the distance as the sun falls below the horizon. Water depths in the harbor are in excess of 200 feet. Anchored cruising boats and local fishing boats are clustered together on a narrow 20 foot shelf along the beach near the dinghy dock. Many of these vessels are unlit, as are the buoys in the harbor. This situation calls for the braille method of anchoring, with Pat and her searchlight on the foredeck, warding off contact with moored fishing skiffs. Maneuvering slowly in darkness, we drop the hook in 25 feet of water to the south of the dock. It will be interesting to see our surroundings in the light of morning. 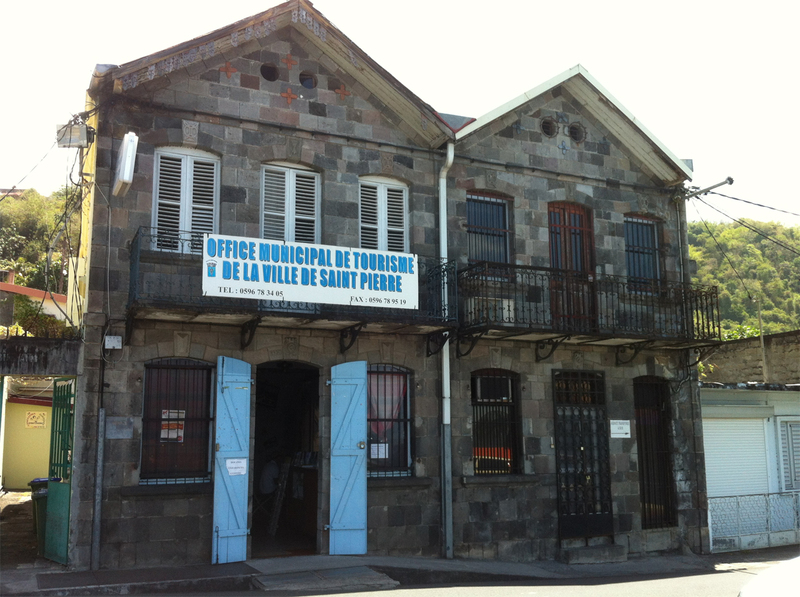 Given the holiday weekend, the Customs office here in St. Pierre is closed until Tuesday morning. Easter Monday is a national holiday. All offices and other places of business are closed. This is a time of private gatherings at the homes and restaurants fronting on the beach. The music is loud. Children play in the water while the adults eat, drink and converse. Not to be outdone, Tom and Cary of Dragon’s Toy join us for Easter dinner and a game of Mexican Train dominoes aboard Cutter Loose. Technically, we are not permitted ashore until Customs are cleared. The French islands, however, are flexible on this rule. Easter Monday is the perfect time to explore the town, given the absence of traffic. 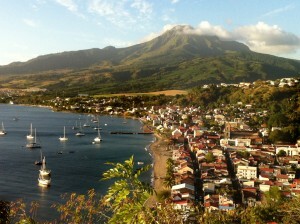 At 4800 feet above sea level, Mount Pelée looms over St. Pierre. 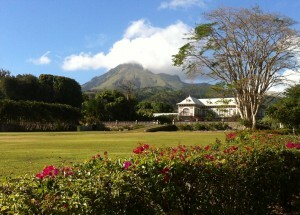 The peak of this volcanic mountain is almost always obscured by clouds. On May 8, 1902, Mt. Pelée exploded, sending a giant fireball of superheated gas into St. Pierre. Some 30,000 residents burned to death in this disaster. The local scuba shop offers dives on the twelve ships that happened to be at anchor in the harbor during the tragedy. The town has been largely rebuilt on the footprints of buildings that were destroyed by fire. 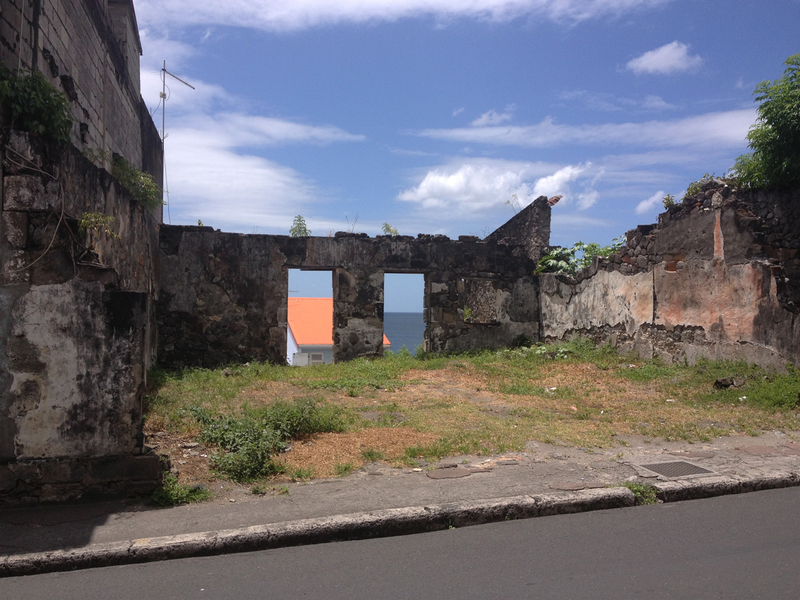 Vacant and charred foundation walls are still in evidence throughout the town, reminders of that fateful event. The waterfront plaza near the dinghy dock has been refurbished as a public market. The narrow one-way street pattern in St. Pierre remains intact. The vibrant business district is filled with shops, restaurants and bars. Despite the constant arrival and departure of cruising boats in the harbor, tourism is not a major industry here. Some shopkeepers know a few words of English. Our command of French is even weaker than their rudimentary English. However, we have learned several key French terms that enable us to clear customs, find a Laundromat, ask for a Wi-Fi password and purchase groceries, drinks and meals. Necessity is the mother of invention. One of our favorite establishments is the restaurant, wine shop and Wi-Fi hotspot L’Alsace. The proprietor is from Strasbourg, France. His English is passable and the German food and wine served in his restaurant is quite good. On the walls of his shop are poster size photos of Strasbourg, including river scenes and buildings with Tudor architecture. From this depiction, Strasbourg gives the appearance of a place that deserves a visit. On Tuesday morning, it is time to clear in at the Tourist Office in St. Pierre which involves completing the now familiar one page form on the Customs computer. 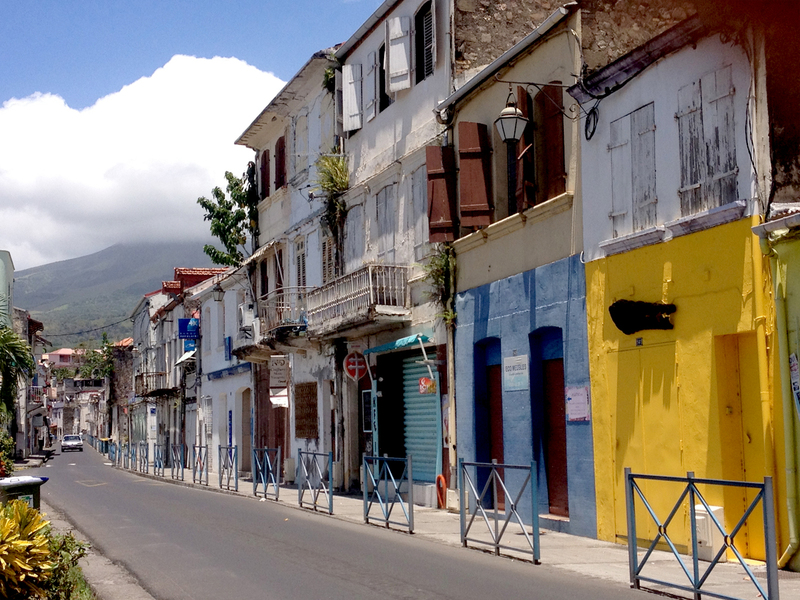 Then it is off on a rental car tour of northern Martinique, including the mountainous, twisty roads around Mt. Pelée and the villages of Precheur and Morne Rouge. The scenery in the mountains is attractive, but not quite as dramatic as that of Dominica. Late in the afternoon, a stop at Distillerie Depaz provides further insight into the events of May 8, 1902. The entire estate of the Depaz family was destroyed by the eruption and rebuilt in the same location. This facility gives the appearance of a manicured park rather than a distillery. Wednesday is devoted largely to laundry detail. One might ask, “how is it possible to devote the better part of a day to such a simple task”? It is a 15 minute walk to the automated Laundromat from the dinghy dock. Three loads of laundry require the equivalent of 30 U.S. dollars in Euro coins, but there is no machine on the premises to make change from bills. Three blocks away, there is a bank. It has only one teller. I am 10th in the queue to speak to the teller. Each customer seems to have a personal relationship with Madame teller. The conversations are lengthy and lively. After 45 minutes waiting in line, I am told that the bank has no coins. 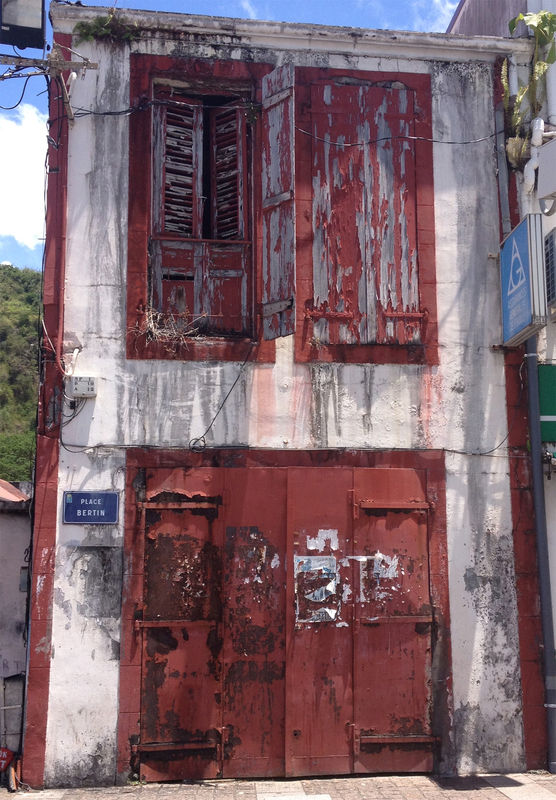 I am told that in order to obtain coins, a visit to a bank in Fort de France will be required. A fellow customer overhears the conversation and directs me in rudimentary English to a different Laundromat on the opposite side of town that accepts Euro bills and provides Euro coins in change. After returning to the original Laundromat, it is off to the alternate Laundromat with laundry bags in tow. Sure enough, this facility accepts Euro bills and provides change. About two hours are required to wash, dry and fold three loads of laundry. By this time, it is midafternoon…time to pause for an espresso, purchase a baguette and check e mail at the local Wi-Fi hot spot. From here, it is back to the dinghy dock for the return to Cutter Loose, just in time for a sundowner to replay the humorous events of the day. Being on cruising time, we are rarely rushed to do anything. Time here in the Caribbean is a less valuable commodity than in the U.S., the dividend of which is reduced stress and anxiety and the ability to enjoy unforeseen events. 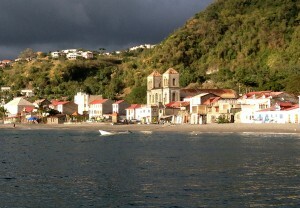 Tomorrow, we will move on from St. Pierre to continue our coastal cruise of Martinique.